Despite the fact that the snowdrops are doing their best, by this time in February it often feels to me as if winter will never end. So I felt in need of a treat, preferably a sunny one. And what’s sunnier than grapefruit? I was actually inspired to use grapefruit by a series of recipes in the first edition of Yummy magazine. This is an impressive on-line magazine put together by a group of French bloggers (well, almost entirely blogueuses, in fact). It can be downloaded in PDF format here but is also available in other formats – click on the logo for details. It’s free to download or read but, of course, it is in French. Well worth a look. All the elements are simple and fairly traditional but it does take a bit of time. This will serve two but there will be some bits and pieces left over as cook’s treats. To make the sablé biscuits, put all the ingredients into a food processor and whiz them up until the mixture looks like sand. Then pulse the machine until the dough is beginning to come together in clumps. Stop before it becomes a solid mass. Tip the dough out onto a lightly floured surface, knead it lightly and bring it gently together into a ball. Wrap the dough in clingfilm and rest it in the fridge for 30 minutes. Unwrap onto a lightly floured surface and roll the dough to a thickness of about 0.5 cm. Cut out some interesting shapes (I used a sort of lozenge shape), place on a silicone sheet on a baking tray and bake at 180°C for around 8 – 10 minutes until they’re a pale golden colour. Remove the biscuits carefully from the baking tray and cool on a wire rack. To make the crème patissière, add the thyme, lemon zest and vanilla paste to the milk and heat it until almost boiling. Leave the milk to infuse for 15 minutes. Put the egg yolks and sugar in a bowl and whisk until thickened and pale. Whisk in the flour and cornflour. Strain the milk and discard the thyme and lemon zest. Bring the milk back to the boil and pour it slowly onto the egg and flour mixture, whisking all the time. Pour the mixture into a clean pan and put it back onto the heat. Bring it back to the boil, stirring constantly. (I always worry that it’s lumpy at first, but it should sort itself out). Once the mixture is smooth and thick, put it into a bowl and lay clingfilm over the top to prevent a skin from forming. Leave to cool, then put into the fridge until needed. Finally, for the caramelised grapefruit, spread a layer of icing sugar over a plate and dip the grapefruit segments into it. Once both sides of the segments have been coated with the sugar, place them briefly in a hot, dry frying pan until the sugar has lightly caramelised. Turn them over and do the same for the other side. This whole process will take very little time but be careful how you handle them because they'll be very delicate. Now simply put the whole thing together. Place a sablé biscuit on the base of the serving dish and pipe the crème patissière onto it. Place some small pieces of the croquant into the crème patissière and arrange the grapefruit segments around the dish. Eat while thinking spring thoughts. 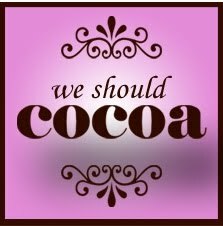 For this month's We Should Cocoa challenge, Choclette from Chocolate Log Blog has chosen tea as the ingredient to go with chocolate. Apart from using tea to soak dried fruit for barmbrack and tea breads of all sorts, I haven't really used it as an ingredient. It got me thinking, though, and I tried out a number of combinations of different teas with various types of chocolate. I have to admit that there are a number of combinations which don't really do it for me. It did make me drink a lot of tea, though, and while sipping a thoughtful cup I came over all Proust-like and remembered a shop that sold tea near where I grew up in South London. I used to go to this shop in the late sixties and early seventies but I don't think it had changed much since Edwardian times. The shopkeeper would pull out dark wooden drawers and dispense small portions of exotic teas into little paper bags. The tea can't have cost much – I was pretty broke at the time (some things don't really change). It was the first time I'd tasted or even heard of green tea, maté, lapsang souchong, gunpowder and, the best name of all, broken orange pekoe. I would buy whichever tea the shopkeeper decided that I should try next and wander off to spend the afternoon drinking tea with a few like-minded friends. We'd talk (we had to, there was no internet then) and listen to Jefferson Airplane and the Incredible String Band – well, it was the late sixties and, yes, I really was that much of a nuisance. Times have changed a lot, of course: the Incredible String Band broke up many years ago and, according to Google street view, the site of the tea shop is now occupied by a bookies. I don't think the world's a better place for that particular change. Or does that make me sound like an old git? Maybe I should go ask Alice…. To get back to the business in hand, this recipe was actually inspired by a dish of tea-poached guinea fowl from the eighties rather than the sixties, but should be odd enough to make the Hatter's day. This will serve 2 greedy people and even manages to be low in fat. Soften the onion and carrot slowly in a little oil. After 10 minutes or so, add the chillies and garlic and continue frying gently for another 5 minutes. Stir in the cumin and coriander and then pour in the tinned tomatoes. (I'm a fan of the tomato fillets, if you can find them. They seem to add an extra richness to this type of sauce, although good plum tomatoes will do fine instead). Scatter over the thyme leaves and sugar, cover the pan and let it bubble away very gently for a few minutes. Purée the peppers and add them to the pan with a generous amount of salt and pepper. Cover the pan and continue to cook it very, very gently while you prepare the chicken. Keep an eye on it, though, and add a little water if it seems to be getting too dry. You need to make enough tea to cover the two chicken breasts in a deep frying pan or whatever you have that's suitable to hold the breasts side by side. I used around a litre of tea made with 3 Ceylon tea bags (no milk of course!). It's best if the tea is not too strong or too tannic – I wouldn't use Assam tea, for instance. Lay the chicken breasts in the pan, cover with the hot tea, sprinkle over a little salt, bring back to the boil and simmer the chicken breasts very gently. How long the chicken takes to poach will vary according to thickness but 10 minutes should be enough for an average size. After this initial cooking, take the pan off the heat and allow the chicken to sit in the tea while it cools for 20 minutes. Towards the end of the 20 minutes, loosen the tomato and pepper sauce with a few spoonfuls of the poaching liquid and stir in one square of chocolate. Once the chocolate has melted and blended in, taste the sauce and add more chocolate if you think it could be richer still. Don't add too much chocolate, though – it's there to add richness rather than a distinct chocolate taste. Now add the beans, cover the pan again and continue the gentle cooking. Remove the chicken from the poaching liquid and slice it quite thinly. Stir the chicken pieces into the sauce and allow it to heat through gently. Serve with something plain like rice and add a dollop of sour cream if you fancy it and you don't mind spoiling the low fat status of the dish. 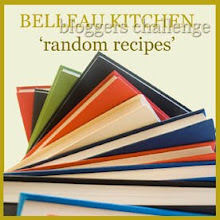 Dom at Belleau Kitchen has issued a new challenge - to cook a random recipe from your cookbook collection. That could turn up some horrors, but I thought I’d give it a go. Dom suggests taking all the books off the shelves, but I couldn't quite face that so I used a random number generator instead. That gave me 3 shelves from the bottom and then 8 books from the right. I found myself holding a copy of 'The Cuisine of Alain Senderens' , first published in 1981 (and out of print, I believe). I had a slightly bad feeling about this – it contains some scary recipes. I've nothing against M. Senderens, of course, especially since he's the man who sent back his three Michelin stars. Come to think of it, how do you do that? Do you put them in a star-shaped envelope and post them? The random page number (66) took me to 'Ragoût Malin' – this is a ragoût of frog's legs, oysters and langoustines. Dom said we shouldn't cheat and should cook whatever recipe was chosen but I wasn't going to ask the local shopkeepers if they had frog's legs – not after the last time. Added to that, I can't afford the ingredients. So I decided that the random number generator must be faulty and tried again (hoping that it wouldn't come up with page 178 - 'Calf's Head in Champagne'). On the second attempt I got page 163, which is M. Senderen's interpretation of a very ancient recipe – Pork Apicius. Although the book doesn't say so, this is a version of the Minutal of Apricots recipe from the Apicius “cookbook” compiled around the 4th century AD. That’s even a little before my time. You have to interpret the Apicius recipes quite freely – the compiler was no Delia when it came to clarity or detail – but there is one thing that M. Senderens doesn't try to replicate in his recipe, namely the use of liquamen. Liquamen and garum were types of fish sauce used widely by the ancient Romans and very common in the Apicius recipes. Since they are now long extinct nobody really knows what they tasted like but they were probably intended to add savouriness to dishes (umami, I suppose). Some people have suggested using nam pla as a substitute, but I chickened out of adding any. Enough history - I think I should get on with the recipe before this turns into an episode of Time Team and a man in a strange hat decides to put a trench through my kitchen. This recipe takes a while but the resulting dish was very pleasing. The amount given should serve 4 people. The day before you want to serve the dish, place the raisins in a bowl with the honey, cumin, dill, mint, crushed peppercorns and red wine. Stir to dissolve the honey, cover and leave overnight. The original recipe suggests soaking the dried apricots in warm water overnight as well, but you may prefer to soak only for an hour or two before you start cooking, if you want to avoid them starting to break down. The next day, generously season the pork with salt and pepper. Brown the pork on all sides in the olive oil for about 10 minutes, then lift it out of the pan and drain. Pour all the fat away from the pan and put it back onto a moderate heat. Add the vinegar, stirring to get all the flavour of the pork from off the pan. Boil for 3 minutes or until almost all the vinegar has evaporated. Add the shallots, carrot, celery, tomatoes and bouquet garni, stir over a moderate heat until the vegetables have started to soften, then add the chicken stock and pork. Bring to the boil, lower the heat and simmer, uncovered, for 15 minutes. Then cover the pan and continue simmering for 70 minutes longer. Lift the pork out of the pan and reserve. Strain the cooking liquid into a large, clean saucepan, pressing the vegetables to extract the maximum amount of juice. Drain the apricots and add them to the strained stock, along with the raisins and their marinade. Put the pork back in the sauce and simmer gently, uncovered, for 25 minutes. Skim off any fat that comes to the surface and adjust the seasoning. Although the original recipe doesn’t suggest it, you may want to adjust the sweet and sour balance to your taste as well before serving. M Senderens suggests serving this dish with a celeriac purée and who am I to disagree with that excellent suggestion. I made some lime pickle recently and, in doing so, I deliberately made too many preserved limes so that I'd have some to use in other recipes. I got carried away with the idea of limes in this recipe and added dried and fresh limes into the mix as well. Let's face it, I really like limes. If you've not tried using preserved or dried limes then I promise all three of the types of lime used here really do taste very different from one another. In a pan that will be large enough to hold all the ingredients, fry the onion gently in a little oil for a few minutes. Add the garlic and ginger and fry for another minute or so. Add the meat, cumin and paprika. Fry gently for two or three minutes more. Add enough hot water to cover the meat (but only just cover it), tuck in the dried lime and grind some black pepper over the pan. (Don't add salt at this point since the preserved lime will be salty when it's added towards the end). Cover the pan and simmer gently for 1½ hours, stirring every so often, by which time the lamb should be very tender. Add the potatoes, carrots and beans – there should be plenty of liquid left at this stage, but add some more water if necessary. Simmer uncovered for 18 – 20 minutes until the vegetables are cooked through and the sauce has reduced. Add the preserved lime, the lime juice and ½ tbsp of honey. Go on cooking very gently for another 10 minutes, stirring frequently. Adjust the seasoning and add the other ½ tbsp of honey if the mixture is still too sour. Serve either with couscous or, better still I think, simply with whatever flat bread takes your fancy.